‘Concerts On The Hill’ is a fresh live music series on the historic grounds of Emily Hill featuring an eclectic and dynamic line-up of local and regional music acts. 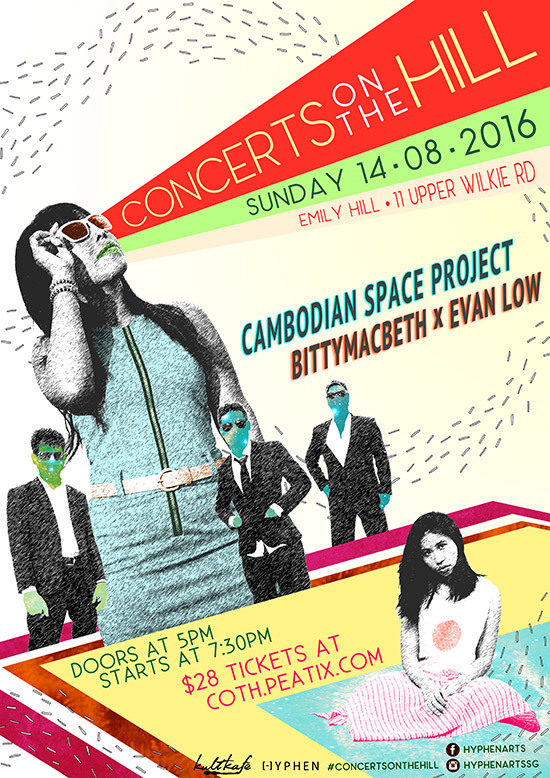 The first gig in the series will kick-off on Sunday 14 August with a two-part concert featuring Cambodian Space Project and bittymacbeth x Evan Low. Critically acclaimed Aussie-Cambodian band Cambodian Space Project will then take to the stage with their unique brand of 60s Cambodian rock’n’roll and trippy psychedelic Khmer soul. With a newly released single ‘Demon Lover’ which pays tribute to 60’s Cambodian cinema and Dutch legends Shocking Blue, Cambodian Space Project will end their 2016 European Summer Tour with a stopover in Singapore for one night only. Fresh off the release of her debut album ‘Beauty for Ashes’ which charted at #1 on iTunes’s Soul chart, local soulful songstress and bassist bittymacbeth aka Beth Yap will collaborate with enigmatic producer Evan Low in an originals only set. Audiences can expect a set full of improvisation and live-looping, coupled with thought-provoking lyrics from this dynamic duo. In partnership with Kult Kafe, ‘Concerts on the Hill’ is creative non-profit Hyphen’s latest initiative exploring unorthodox venues as platforms for the presentation of art and live music. For this series, audiences can expect a diverse range of acts designed to showcase the myriad of talent and musical styles from across the region. $28 pre-sale / $22 student concession (ID required) / $35 on the door / Kids under 12 go free!